The equipment choices your photographer makes are extremely important and have a big impact on the quality of your photos. We use all professional Canon camera gear and we shoot in RAW. Read on to find out more details about our gear and how we think it makes us stand apart from other area photographers. 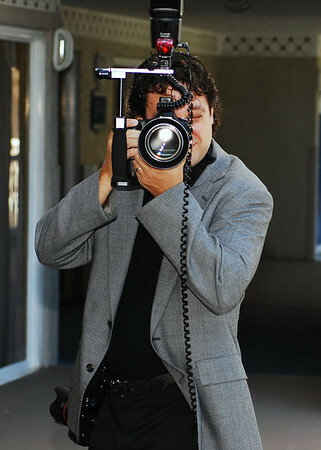 We always have 3-4 professional cameras with us on every job. We have numerous additional batteries, memory cards, flashes, etc. If something breaks, we always have a replacement! Unlike virtually all of our competition we do not rely on zoom lenses while working indoors under available light. Instead, we use the highest quality PRIME lenses. These lenses are much more costly than comparable zoom lenses. However, they let in 400-600% more light. This advantage is critical when working inside a church that does not allow the use of flash during the ceremony, or in other dimly lit areas, such as your reception. During your wedding ceremony, Jason will typically carry two Canon 5D Mark III cameras - one with an EF 85mm f/1.2 L II USM PRIME lens and one with a EF 35MM f/1.4 L USM PRIME lens. This combination covers both the wide-angle and telephoto focal lengths without needing a zoom lens. This approach is much more expensive and requires more skill on part of the photographer, but your wedding is worth it. The 22.3-megapixel EOS 5D Mark III is one of Canon's "full frame" professional digital cameras, and has been called "the world's best digital SLR.". This allows our professional lenses to be used as they were designed without a conversion factor or focal length magnifier. The 5D Mark III has excellent high ISO performance and works especially well in low light conditions such as sunset, dusk, or inside a church and produces smooth background blur. 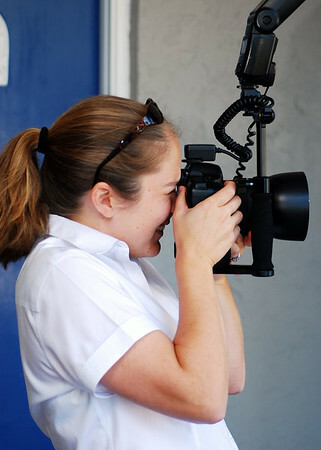 At the back of the church (or end of the aisle), Allyson shoots with another 5D Mark III. Its superb high ISO performance lets us create smooth, clean, beautiful and colorful images in a church's limited light without a flash. It focuses at lightning speed and shoots at 6 frames per second; great for capturing fleeting moments during your ceremony, including THE KISS! The 5D Mark III also writes to two memory cards simultaneously, ensuring that no images are lost due to camera or card malfunction. Allyson uses the EF 70-200mm f/2.8 L IS USM lens with this camera. The 70-200 zoom range lets her shoot from a different angle without intruding on the ceremony. Before and after the ceremony (for "getting ready" photos, formals, and your reception), we use various combinations of the above cameras and lenses, as well as a 100mm EF f/2.8 USM MACRO lens for fine details, wide angle and fish-eye lenses and a Canon EF 24-70mm f/2.8 L USM for a variety of shots. We also use the 70-200mm mentioned above as our primary lens for beach portraits. With these professional camera bodies (in locations where flash is allowed) we use three 600 EX-RT flashes with external battery packs. The 600 EX-RT is Canon's top-of-the-line, professional grade external flash. This professional flash recycles quickly and quietly, assuring that we do not miss any important shots due to a flash mis-fire. We shoot beach portraits with one flash on the camera and another on a light stand to create some great "pop!" Most importantly, we shoot all of our photos in RAW format, allowing us to preserve the maximum amount of image data for every photo we capture. This gives us the ability to "tweak" the white balance, color, and exposure on every image before we upload to our online galleries. We process all images using Adobe Lightroom, select images in Adobe Photoshop, and we use a professional retouching service for all images that become prints or go in albums. This process, while extremely time consuming, means we give you the best possible output from our professional cameras and lenses every single time. Again, we think your wedding is worth this extra step! PS - we also make sure your photos are safe - we keep two copies of every photo using RAID technology, plus we upload them to our website. We don't clear our memory cards until we've got your photos saved in multiple locations. You won't hear any stories from us about lost files!